Oral History Workshops this Spring! 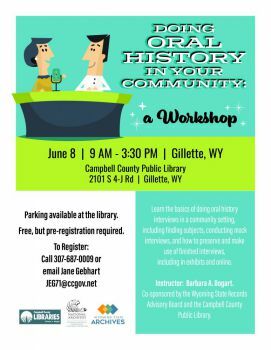 The State Historical Records Advisory Board and the Campbell County Public Library will co-sponsor Barbara Bogart's successful workshop “Doing Oral History in Your Community." This free hands-on session will show you how to plan and conduct oral history interviews of local residents. Where: Campbell County Public Library at 2101 S 4-J Rd in Gillette, WY. When: Saturday, June 8, 9 a.m. to 3:30 p.m.
Instructor, Barbara Allen Bogart, says, “In this oral history workshop, we will cover the basics of doing oral history in a community setting, including choosing a focus, identifying narrators, preparing an interview guide, choosing recording equipment, and conducting the interview. Bogart has been involved in oral history for more than 30 years. A resident of Wyoming since 1991, Dr. Bogart has worked at the Wyoming State Museum and Uinta County Museum, and has published two books and numerous articles based on oral histories. She especially enjoys presenting oral history workshops to community groups. The Wyoming State Historical Records Advisory Board (SHRAB) promotes the identification, preservation and dissemination of Wyoming’s historical records. To accomplish this mission, the Board awards grants and sponsors workshops for archives, libraries, museums, and others throughout the state that collect, manage, and preserve historical records. The SHRAB’s activities are made possible by a grant from the National Historical Publications and Records Commission. The Wyoming SHRAB consists of public officials and private citizens who believe in the importance of preserving our state's records and in making them available for the public. Apply for Grants - see the section below. Grants of up $2500.00 are available to Wyoming residents for projects that further the SHRAB’s mission of promoting the identification, preservation, and dissemination of Wyoming’s historical records. The SHRAB will assign priority to those applications that show commitment to developing and/or implementing projects that will lead to enhanced online access to historical records. Please review the grant guidelines and application for more information about how to apply, the eligibility requirements, and reporting responsibilities. Develop a statewide cooperative approach for the preservation of Wyoming records of enduring value. Encourage and support ongoing training programs for state, tribal and local governments, local repositories, organizations and others involved in records care. Facilitate access to and increase the use of Wyoming’s records. The archived version of this webinar is available at: https://wyocast.uwyo.edu/WyoCast/Play/e26b59875aa24cbbac09484c0a25f3b61d?catalog=b3edf27d-f1a3-4752-b149-e95d7c7dd956.